I had a panic attack in the grocery store. Our usual weekend routine, often sees us leaving the house Sunday morning with intention to grab groceries, and later heading home empty handed with bellies full of restaurant food, having run a handful of errands in between. This particular Sunday we ate out for breakfast, visited the local farmer’s market, window shopped for a new dehumidifier, picked up a new booster seat for the big kid (Little sister just got a new car seat, so Rainbow wanted in on the action too. That, plus she had grown too tall for her old one), and stopped in at the local comic book store to pick up our monthly pulls, before finally heading to get groceries. My husband dropped me and the two girls off at the grocery store and headed back to Toys R Us to pick up this big Star Wars Micro Machines set the big kid has had her eye on for the past few months. When we were in the store earlier that day shopping for a booster we noticed the set was on sale for $20 off, and with her birthday coming up next month it seems like a solid idea. That is until I found myself in the grocery store parking lot with two kids, solo. The parking lot was packed. The cart corral was almost empty. The grocery store was busy. Ridiculously busy. Within sixty seconds of walking into the store I was swearing to myself that I would never shop on a Sunday afternoon ever, ever, again. I hate the fact that my extra-tall six year old is too big to ride in the grocery cart any more. Normally hubby and I split up at the door, with him taking one kid off to the deli to get lunchmeats, bread and cheese, while I take the other child with me on my quest to get fresh meat and produce. However on this particular day I found myself standing in the doorway on my own, with both kids in tow, and I almost immediately felt overwhelmed. The narrow aisles were packed with people. There was no space for my daughter to hold the cart and walk next to me. I had to squeeze down the aisles with the kids following behind me single file. I felt claustrophobic and paranoid. Everyone was too close. There were too many damn people. No room to move my cart. No room to breathe. And I kept having to turn around and look at my kids, to make sure they were following close behind me. I didn’t have a grocery list. Just this vague outline in my mind, an idea that I needed so many dinners, lunches for the week, whatever veggies looked fresh. It’s usually enough to get me by, but today I couldn’t keep the outline straight in my head. How many dinners was I at? Stop and count the bundles of fresh meat wrapped up in butcher’s paper sitting in the bottom of my cart. Okay, that’s three, no wait was it four? 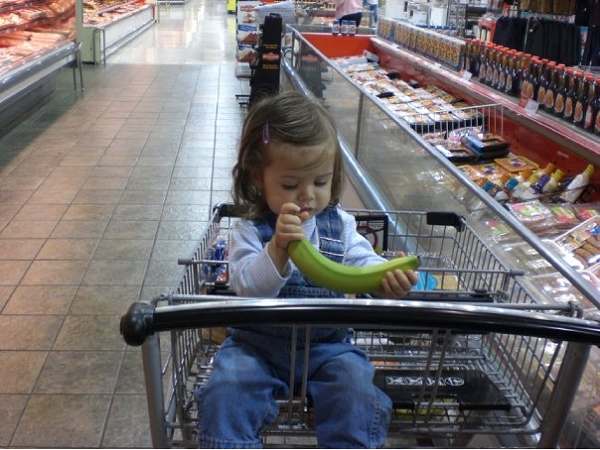 I find myself missing the days when I had just one kid, who fit in a cart, and was easily distracted by a banana to hold on to. The kids were squabbling. Whenever I took my hands off the handle they would fight over holding it, inching the cart forward, coming perilously close to bumping other shoppers. One was trying to dance, in the packed grocery store aisle. The other, who sure as heck is old enough to know better, was sitting on the edge of the cooler. I kept telling them, “Stop.”, “Don’t”. Don’t touch. Don’t touch the food. Don’t touch your sister. Don’t touch the cart. Don’t fight. Just don’t. Look with your eyes. If you see something you want ask mom first. Watch out. You can’t spin and dance in here. This is not a space for playing. Why don’t you help me pick out some fruit? What do you mean you don’t like this salad? You don’t like carrot muffins? Since when? Are you kidding me? Just stop. Stop. Get your hands off your sister. Do Not Touch The Cart. Please. Just. Stop. One super packed grocery store, plus one more kid than I normally walk around with. Apparently that’s all it takes to make me start freaking out. I was shaking and almost crying. I was trying very hard not to loose my cool with my children, who continued to misbehave. There were just too many damn people in the place. And it was just too much. I couldn’t remember my list in my head. I couldn’t remember what I had already put in the cart. My heart was racing. I couldn’t breathe. I wanted to just leave everything there in the middle of the aisle and walk out of the store and go sit in the parking lot until my husband got back. Recounting it here, now, it seems silly. Telling you all this, I feel so foolish. But at the time it was very real. 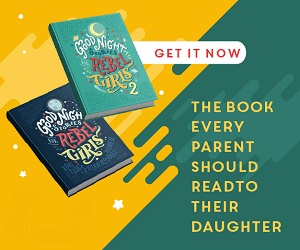 I find it difficult to be a good parent when I am anxious and trying not to freak out, when every little thing my children do seems amplified and stresses me out further. It’s hard to keep my cool, to not lose my temper with my girls. Standing there in the packed produce aisle, squashed up against the apple display, I felt so helpless and angry and lost. I was so relieved when my husband finally walked into the store that day. Relieved to be able to hand one child off to him, to only have to maneuver one kid down the packed aisles, one kid, who, no longer having a sparring partner, was now suddenly as good as gold. Relieved to not have to go talk to the lady at the meat counter, to let my husband head over to the deli and figure out what type of salami my daughter wanted in her lunch that week. Happy to just get in line and pay for everything and get the heck out of there. This is another reason I am finding Zehrs new Click & Collect service to be so darn amazing. I have got to say, shopping from home while pacing the kitchen and double checking the contents of my cabinets is way way WAY better than trying to remember my list while feeling trapped and panicky in a crowded produce aisle, and shopping on my tablet while my kids are playing in the front room beats out trying to herd them through a grocery store, hands down, anytime. What about you folks? Do you always stay cool and calm in the grocery store? Or, like me, do you sometimes get stressed and panic while trying to figure out which jar of peanut butter to grab? 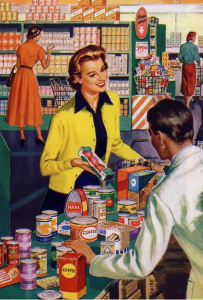 Am I the only one who finds grocery shopping with kids in tow to be ridiculously stressful? I know all sorts of parents are out there, everyday, shopping solo with multiple kids. Why the heck do I find this so challenging? But just doing groceries makes me nervous.